Deconstructing the new Apple watch is not a game for amateurs. ABI Research’s TeardownIQ reveals a design centered on a custom Apple Processor (APL 0778) but includes Broadcom (BCM43342), Dialog PMU, NXP (NFC controller), and AMS (NFC booster) connectivity, IDT wireless charger receiver, Elpida RAM, SanDisk / Toshiba Flash memory, STM sensors, and a couple ADI capacitive touch solutions. A few of key surprises in the design are two touch controller design wins for ADI, and the IDT wireless charging receiver. 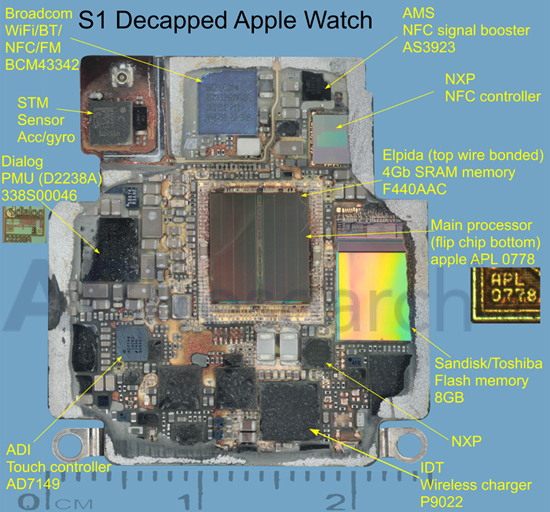 ADI has not seen a lot of design wins in mobile devices over the last 3 to 5 years but it seems to have a new focus as it has shown up in this Apple design and its sensors were revealed in a few other very recent teardowns. These findings are part of ABI Research’s Teardowns Market Research, which includes Parts Lists, High-Res Photos, and Power and Performance Testing for the Apple Watch.